It's no secret that the church of Jesus Christ was built upon the blood of martyrs. It's a fact often forgotten, unknown, or overlooked. The Christianity we grew up with in the in the Western nations has flourished because of its faithfulness to God's word and its commitment to a moral and ethically based society built upon solid biblical principles. Let's face it, we have gotten used to it. We've become accustomed to living in peace and flourishing with our religious liberties and freedoms of speech. But when these become threatened, as the current tide seems to suggest, how will we react? Will we still follow Jesus? The Apostle Paul declared, “Yes, and all who desire to live godly in Christ Jesus will suffer persecution” (2 Tim. 3:12, emphasis added). (Tweet this) This is an important statement considering the theological spectrum of the sliced and diced church today. One may ask why this is so? The answer lays in Paul’s placement of emphasis on the phrase only those desiring to live godly as being the recipients of hostile consequences. Therefore he calls out a certain devoted group—a people that desire to live godly and sanctified lives—keeping the teachings of Christ, and holding to the truth of biblical revelation in all circumstance. Paul says this group would have a desire to live godly or piously and because of this, they would suffer persecution. To live our lives in such manner is probably the highest honor that could be bestowed upon a believer during this earthly sojourn. Jesus Himself stated, “Blessed are those who are persecuted for righteousness' sake, For theirs is the kingdom of heaven” (Matt. 5:10). The church is not without example, for history has provided us the immortal names of many men and women who have willingly given their lives in defense of the faith. One need not venture to far into the book of Acts before they encounter hostilities, (Tweet this) like those that surrounded Peter and the Apostles in Acts 3 through 6. Then turning to the next chapter we run into the blessed Stephen of Acts 7, and later Paul in Acts 9, and the beloved James of Acts 12—and that is just the first part of the book! All of these, through faith in Jesus, set examples for all those who would follow. We must also call to remembrance those in the early church—the 1st to 4th centuries. These were pioneers of the faith—the men and women that would rather face off with hungry lions in the Roman arena, than deny the Lord who bought them. To this group of blessed defenders belonged the Apostles of the Lord, and others such as Polycarp, Perpetua, Justin Martyr, Polthinus, Alexander, Blandina, Felicity, and hundreds of others. Some were crucified; others tortured. Some sealed their faith by being doused with flammable liquid, only to be hoisted up on poles to light the night sky of Nero’s gardens. Many others were mercilessly torn apart by beasts; being used as entertainment at the hands of the Roman Caesars. Then there are those who suffered under the spread of Islam, beginning in the 7th century AD, and those of the 14th to 17th century reformation who faced cruel and perilous persecutions, tribunals, and burnings at the stake from the Roman church—all in defense of the faith. These believers would fit Paul’s description of godly believers, living godly lives, in loyalty to Jesus Christ. Like many today, these also lived among many groups who by their lips confessed Christ, but by their actions denied knowing Him. Today these can be found existing independent of others in almost all Christian assemblies. They also compose the tightly interlaced liberal groups, found swelling the ranks of certain flavors of Catholicism and Mainline Protestantism. These are the deceived, and the deceivers of the day; they do not accurately represent Christ to their churches or to the world. In their quest to be all things to all people, they have sacrificed the truth of the Bible in exchange for popularity and worldly gain. It is these that are responsible for the great divides we see in modern Christianity. 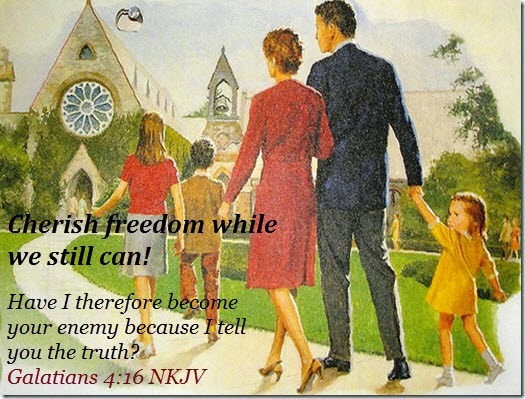 Rather than hold to the truth, thereby unifying themselves with others of solid faith, they would rather please the world in support of the ungodly popular immoralities that serve only to oppress the faithful. It is among this group of wolf-like professors—godly in form only, that you will be hard pressed to see any persecution for the cause of Christ. Their ranks may swell but persecution will not come nigh them. They will be the first to raise the white flag of surrender, and in doing so, fall head-long into the mold of a world being shaped by the Enemy. The Sifted Generation will be out in the spring collection from the publisher. (Tweet this) Please help me spread the message of truth that teaches believers the importance of 100% devotion to Jesus by purchasing a copy of the book or by praying for my ministry. My only goal is to reach people with the gospel of Christ - To know Christ and Him crucified (1 Cor. 2:2).